CALGARY, Alberta, April 18, 2018 (GLOBE NEWSWIRE) — The McCann Family Foundation and Canadian Legacy Project today announced Homes For Heroes Foundation, a new registered charity with the goal to end homelessness among Canadian military veterans. nd belonging for our Canadian military veterans experiencing homelessness. The foundation’s mandate is to provide, to those who have served in the Canadian Armed Forces, housing and the framework needed to ensure a successful transition into civilian life. The first Homes For Heroes is planned for Calgary in the Bridgeland community on land sub-leased from the Canadian Institute for the Blind. The first village will feature 20 tiny homes, a resource centre, community gardens and memorials to Canadian soldiers who lost their lives in Afghanistan. In contrast to traditional homeless services, a tiny home provides our veterans with privacy, security, peer-to-peer support, and the ability to integrate back into society at a comfortable pace. Veteran support services are facilitated through The Mustard Seed. Their onsite resource centre will provide our veterans with mentoring, case management, counselling, and linkage to other programs and services. “Homes For Heroes village will be a unique tiny home village that offers a solution to the homeless epidemic facing some our Canadian military veterans. Each home will be named after a Canadian soldier who lost his or her life in Afghanistan. We owe it to our Canadian soldiers to help them through the difficult times they might be encountering and we believe we have a solution to end the homeless issues they are facing.” stated David Howard, Co-Founder and President of Homes For Heroes Foundation. It is estimated that over 2,500 Canadian military veterans are homeless and have not been successful in transitioning from their military career to healthy and productive civilian lives. The Homes For Heroes Foundation is an initiative that will assist with re-integration of military veterans into civilian life through the provision of affordable housing and a robust support system. “We have great support from the City of Calgary, ATCO, Canadian Institute for the Blind, Aplin Martin, NAK Design Strategic, Hunter/Tristan and a number of other businesses and individuals that have helped to make this dream a reality.” said Murray McCann Co-Founder and Chairman of Homes For Heroes Foundation. “To assist a veteran evolve from homelessness and despondency to their original vitality and self-dependency gives us great satisfaction. The villages across Canada will allow grateful Canadians to show our veterans the appreciation we feel for their service to our country.” Stated McCann. Further support has been given to the Homes For Heroes Foundation by CP Rail. CP Rail developed an annual event to raise funds and awareness called “Spin for a Veteran”. www.spin4vets.ca “At CP, we are excited for the opportunity to contribute to impactful initiatives such as Homes for Heroes. It is important to support those who have served our country, and we are inspired by this unique way to give back to our veterans.” stated Scott MacDonald, CP Senior Vice-President Operations. 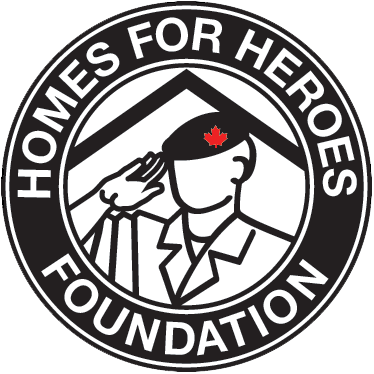 Homes For Heroes Foundation is a registered charity with the goal to build villages in all major cities across Canada. In order to be successful, Homes For Heroes is looking for further financial support and land donations. To learn more and support Homes For Heroes visit www.h4hf.ca. ** Attached: concept design for the first village and the interior of the homes.